The world’s rarely visited, most challenging destinations make for the greatest and most memorable adventures, don’t they? Snow Hill has definitely earned its reputation as one of the toughest places on earth to reach, but you’ll have 4 exciting opportunities to make it happen in 2018! 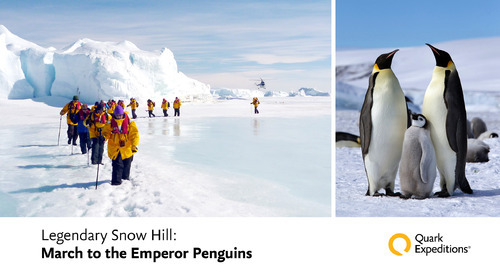 Our exclusive Legendary Snow Hill: March to the Emperor Penguins expedition guides you right into the heart of the isolated realm of the world’s northernmost Emperor colony. Antarctica’s estimated 595,000 Emperor penguins have a huge range and are found on the ice or in the waters surrounding Antarctica. The largest of the penguin species, an adult Emperor tips the scales at 30kg (66 lbs), twice as much as the next-heaviest King penguin. 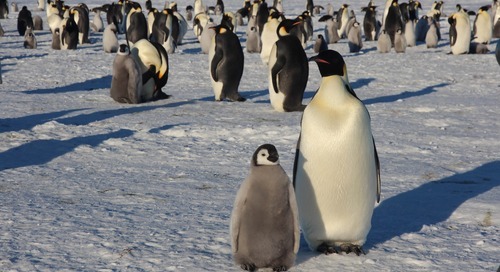 About 4,000 breeding pairs live on the sea ice just off of Snow Hill, in the Weddell Sea. It’s one of the hardest colonies to reach, but also the closest in proximity to South America and the furthest north. 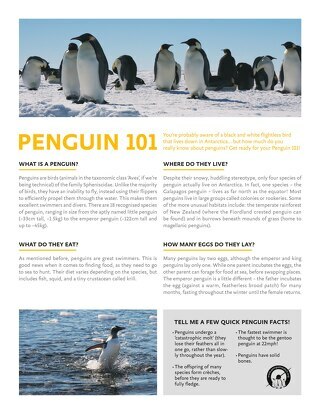 This has made for a fascinating mystery for penguin scientists, who want to understand how this colony has evolved so far north, and how we can help protect them from the effects of climate change. Approximately 4,000 breeding pairs reside on the ice near Snow Hill in the northernmost Emperor rookery in the world, surrounded by thick sea ice — you'll need an icebreaker to get there! The only way to reach this colony is by powering through thick sea ice aboard our passenger-favorite icebreaker, Kapitan Khlebnikov. You’ll soar over the dramatic, spellbinding icescape by helicopter, then trek the rest of the way over a marked ice path on foot to avoid disturbing the colony in the midst of its breeding season. 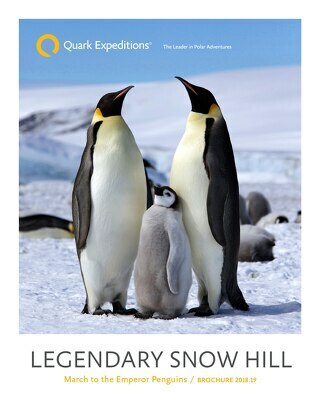 Legendary Snow Hill: March to the Emperor Penguins is your opportunity to become one of only a handful of people on earth to have witnessed the spectacle of this colony of thousands of Emperors in its icy, typically inaccessible natural environment. Emperors are notoriously tough and have adapted to survive -60°C (-76°F) lows and blizzards of 200 km/h (124 mph). They have 4 layers of scale-like feathers, which provide waterproofing and protection from the harsh winds. Their short, sturdy tail feathers provide stability and support as they rock back on their tails while incubating an egg in the punishing conditions. Unlike other penguin species, Emperors breed on ice and it’s the adult male who is responsible for protecting the egg until it hatches. Emperors will raise one chick per year and while the female of the pair heads off to hunt, the male tucks the single egg into a flap of abdominal skin called his brood pouch. The male adults huddle together, their ample layers of body fat and communal body heat the only thing standing between their precious eggs and the most frigid conditions on the planet. They take turns on the inside of the pack, trying to ensure the survival of the group. It’s a life fraught with danger; the group must stay watchful for leopard seals and killer whales, who love to make a meal of an adult Emperor. Skuas swoop overhead, constantly on the lookout for a tasty, untended egg. Emperors can dive deeper than any other bird, to depths of 565 m (1,850 ft.) to hunt for fish, krill and squid. Their unique aerodynamic build makes them fast in the water, and adaptations in the way their body handles oxygen allows them to stay underwater for up to 22 minutes. An adult Emperor penguin stands surrounded by hatchlings just preparing to moult at Snow Hill, Antarctica. The mother returns only once the chicks have hatched, where she’ll regurgitate food for the hatchlings to eat. Her partner, who’s gone through most of his body’s food stores by now, can finally return to the sea to fish. 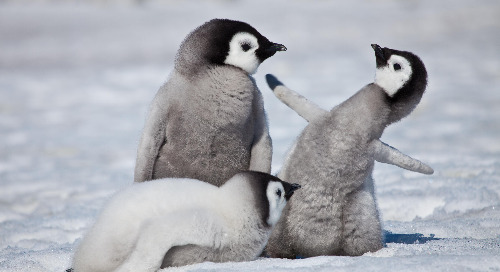 As spring approaches in Antarctica, chicks huddle in crèches to stay warm. Their parents head to the sea to fish, in an effort to build fat stores that will provide the energy needed for their annual moult. December brings warmer weather and the breaking up of the outer ice, which brings the sea closer to the Emperors’ breeding grounds. Nearly finished moulting, the juvenile penguins are ready to try swimming and fishing on their own. Their parents will hang back, as their moult only begins once their young have headed off to sea. While they’re in the process of replacing their feathers, the adults lack waterproofing and are unable to fish. By January, new plumage has grown in and the adult penguins are ravenous, more than ready to head to sea and hunt once again. Early season Antarctica offers opportunities to spot 10-12 species of birds, some of them unique. I spoke with one of our expedition team members, ornithologist Fabrice Genevois, about what excites him most about the opportunity to visit Snow Hill. For him, it’s all about the birds. 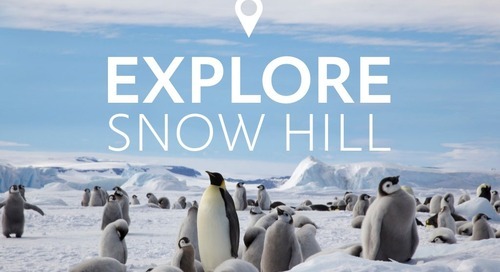 The journey to Snow Hill offers an exciting opportunity to see not only Emperor penguins, but snow petrels and Antarctic petrels, he said, which you can’t see anywhere else in the world. 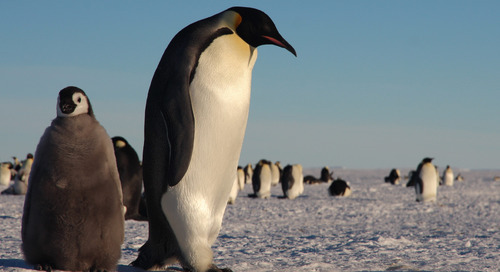 Trek to the Snow Hill Emperor Penguins by icebreaker, helicopter and on foot. Fabrice joins a skilled and experienced team in leading passengers on this exclusive journey to the iconic Emperor penguin rookery. You’ll travel with Operation and Expedition Leaders (ELs) David (Woody) Wood*, an Australian historian with an unquenchable passion for the Polar Regions, and Shane Evoy* , a Quark veteran who’s led 125 expeditions and been to Snow Hill 15 times, more than any other EL. Photographer Sue Flood, a wildlife and travel photography pro who has been working in the polar regions for over two decades. Ornithologist and Biologist Fabrice Genevois, whose work and research in the polar regions spans all the way back to 1989 when he spent 18 months doing field research in the remote, sub-Antarctic Kerguelen Islands. Frozen Planet Series Producer Vanessa Berlowitz, who has filmed in over 100 countries as part of the BBC’s Natural History Unit. March of the Penguins Cinematographer Laurent Chalet, whose film career includes fiction and documentaries. Traveling aboard the 24,000 horsepower Kapitan Khlebnikov is an exceptional adventure in its own right. 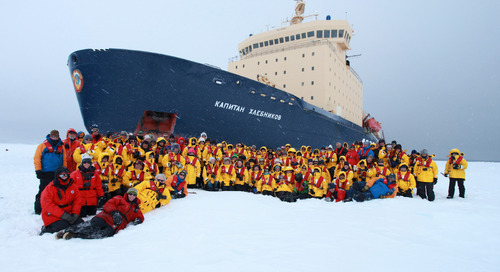 Just ask retired Canadian schoolteacher Kerry Peters, who’s taken expeditions on this iconic icebreaker eight times! Each of Kapitan Khlebnikov’s hulls is 1.75 metres thick at the ice skirt. Water moves at 74 tonnes per minute between hulls; a polymer paint coating on the ice skirt preventing friction and a system to force pressurized air from above the keel to halfway down the ship also assist in ice-breaking. You’ll have a variety of incredible vantage points from which to take in the Kapitan Khlebnikov’s immense ice-breaking power, from the sights and sounds of the bridge and bow, to the mesmerizing aerial views from the flightseeing helicopters. 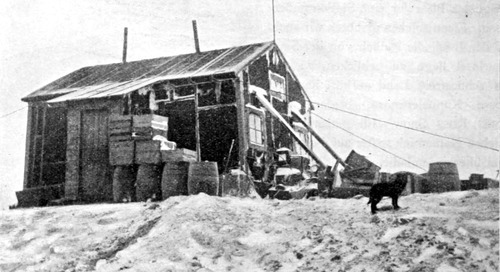 This was the first ship to bring Quark passengers to Snow Hill Island and is the only ship to have circumnavigated Antarctica twice. It’s piloted by experts, too. The captain’s team includes dedicated professionals with advanced training in ice and hydrology, who conduct ice reconnaissance to evaluate ice density and conditions ahead of your off-ship excursions. Witness thousands of adult Emperor penguins and their chicks in their sea ice rookery near Snow Hill in the Weddell Sea. Emperor penguins somehow thrive in conditions few species could tolerate, and this colony near the northern tip of Antarctica is even more a mystery than most. The window of opportunity for sighting this geographically inaccessible rookery is so slim that scientists and researchers are joining passengers on select Legendary Snow Hill: March to the Emperor Penguins departures. They’re seizing this remarkable opportunity to gather penguin DNA and learn more about this colony’s evolution in the warmer, more northern part of the Antarctic region. You can read more about what Dr. Tom Hart and his Penguin Watch researchers hope to accomplish here. Four exclusive departures from October 6th to November 11th 2018 take you through the iconic Drake Passage crossing and right into the action at this remote Emperor rookery. Want to learn more?